But I can get these wonderful, thin turkey cutlets. They cook in minutes on the grill and are great for making ‘birds’ or rolls, wrapped around Prosciutto or asparagus or just about anything you like. They also absorb the flavors from a marinade very well. 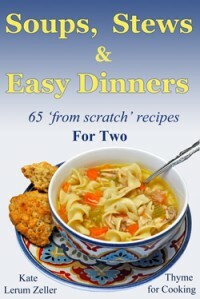 You could substitute thin pork or veal cutlets, or chicken breasts pounded thinly. If you can’t find turkey, and want it, buy a breast or tenderloin and either have your butcher slice it or do it yourself. Put turkey in a dish and pour marinade over. Let marinate for 15 minutes or up to 2 hours. 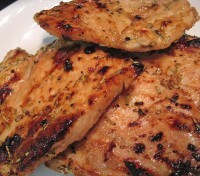 Remove from marinade and cook on hot barbecue grill for 3 – 4 minutes per side or until done. OR sauté in nonstick skillet for 4 – 6 minutes a side or until done. The building retro continues….. with an actual bedroom for us. 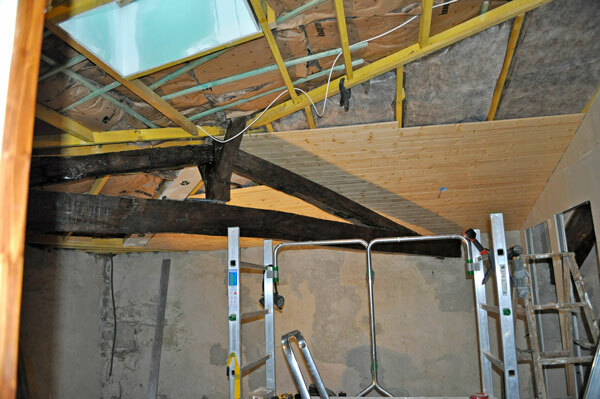 This is the beginning – as always, the framework for the ceiling and the insulation. 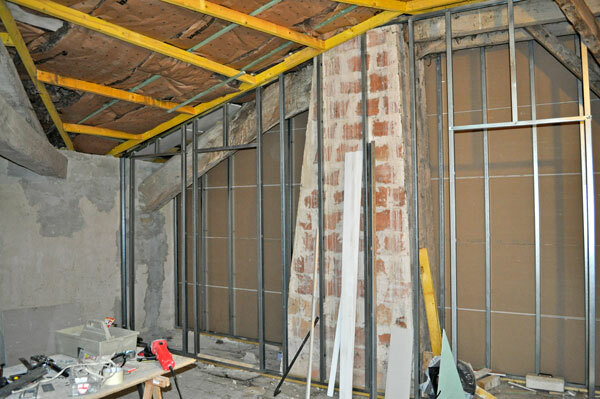 These outside walls required a lot of patching, filling in cracks and building up the tops of the walls so the ceiling would have a level top to rest on. Not there is anything remotely level about the ceilings….. Remember, this had been a granary. They weren’t overly fussy about the state of the walls. As is typical of a house this old there were no closets, anywhere. People used armoires. We did, however, have a few chimneys, even if they had been cut off at the roof. We decided to incorporate them into the floor plan (removing them would have been a nightmare). Luckily, they were just the right size to fit into a closet and act as a divider, giving us a flush wall. The ceilings on this floor were all very challenging, with many different angles and levels. 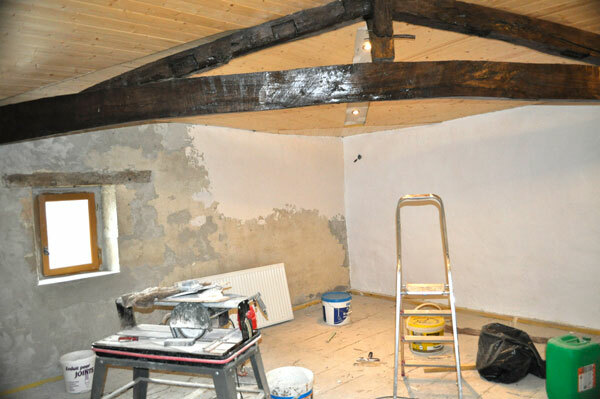 We wanted to save the big beams, which he did, and refinished them. 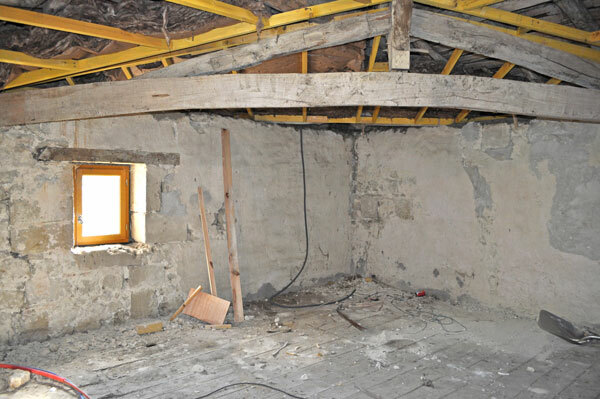 Once the ceiling was finished, and the walls patched, he tried his hand at plastering. The inside walls were sheet rock – he’s an old hand at that. 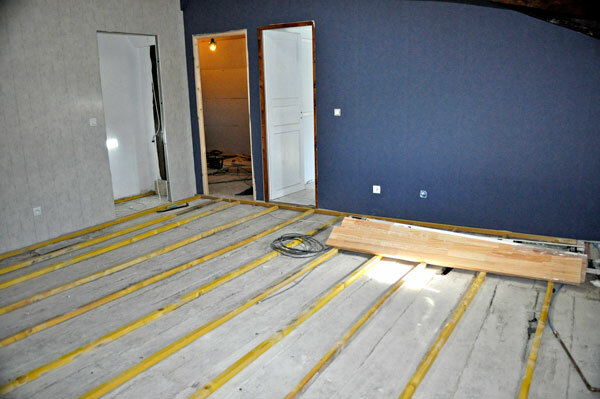 Once they were papered, the work on the floor started. And we finally got to move it! This is the photo I took right after we moved in – when things were still very dusty. When I’m done with all of these memories, (and my house is clean) I’ll take current photos of all of the rooms. Again great color on that turkey. The bedroom work and final look still blows me away … so eautiful. Oh please! My house is always that dusty and I don’t know how to get rid of it. I’ve tried wet rags, vacuums, just about anything you can think of and the dust just keeps multiplying. Your bedroom is absolutely gorgeous! You are so fortunate to have a hubby who knows how to do that stuff or if he doesn’t, he’s more than willing to tackle it. And he’s very good at it. 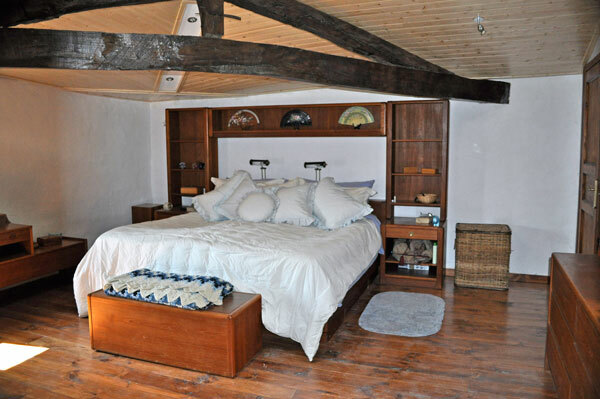 two things – my mother used to make Veal ‘Birds’ and what a gorgeous bedroom !! Tanna, thanks, on both counts…. Hard to believe what it looked like when we bought it. nightsmusic,, well, mine is too, Heating with wood is dirty, So is living surrounded by farms and having 2 big dogs. Kate, I still make veal birds – although here it’s easier to find the thin turkey. And thanks! Wow, you did a beautiful job. We made these last night. We altered it a bit and used apple cider vinegar and fresh parsley instead of rosemary because we didn’t have any. They were fantastic!! Can’t wait to use the marinade again on other meats.